DESCRIPTION & INGREDIENTS: Corn, Roasted Peanuts, Rendered Beef Suet, Oats, Soy Oil. Peanut Delights are mixed into a soft dough texture which is pressed into cake form. 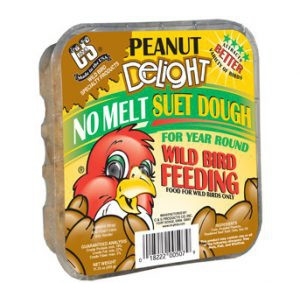 C&S process creates the only true NO MELT bird suet product line. For YEAR ROUND Wild Bird Feeding in every climate.